U.S. stocks surged Wednesday, recovering all their losses from a Christmas Eve plunge and placing the market on track for its best day in nine months. 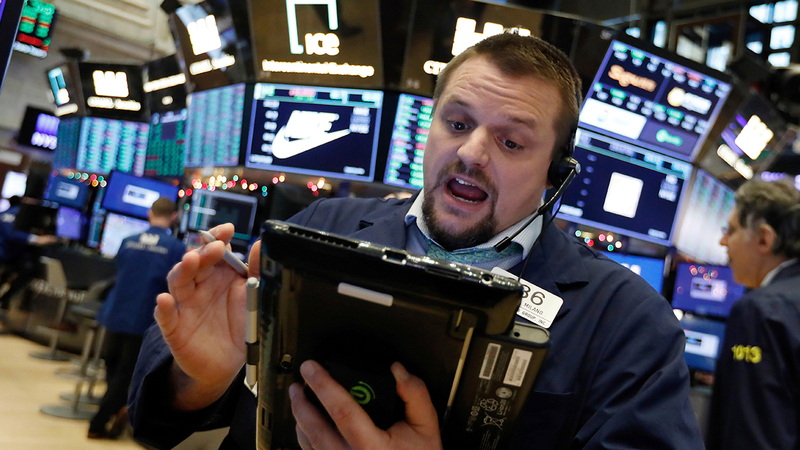 Gains in technology companies, retailers, health care and internet stocks drove the broad rally, which gave the benchmark S&P 500 index some breathing room after it slid Monday to just shy of what Wall Street calls a bear market - a 20 percent fall from an index's peak. "Today simply can only be really chalked up to a reflex rally after having been oversold," said Sam Stovall, chief investment strategist for CFRA. "The real question is do we have follow-through for the rest of this week." The S&P 500 index rose 80 points, or 3.4 percent, to 2,431 of 3:24 p.m. Eastern Time. The Dow Jones Industrial Average climbed 731 points, or 3.4 percent, to 22,524. The tech-heavy Nasdaq gained 265 points, or 4.3 percent, to 6,458. The Russell 2000 index of smaller-company stocks picked up 45 points, or 3.6 percent, 1,312. Wednesday's gains pulled the S&P 500 back somewhat from the brink of a bear market, where it finished after a shortened trading session Monday. That would mark the end to the longest bull market for stocks in modern history after nearly 10 years. "The market is trying to find an equilibrium between earnings, revenue growth and the economy, but when you have an onslaught of headlines that just manifest uncertainty from Washington, it just feeds negative sentiment," said Quincy Krosby, chief market strategist at Prudential Financial. The market's sharp downturn since October intensified this month, erasing all of its 2018 gains and nudging the S&P 500 closer to its worst year since 2008. Despite Wednesday's rally, stocks are on track for their worst December since 1931, during the depths of the Great Depression. "This is a market that's heavily oversold, and typically you expect a strong bounce following that," Krosby said. "Oil prices have just moved quite markedly. And retail is having a very strong holiday season." Even so, traders have been jittery this autumn over signs that the global economy is slowing, the escalating U.S. trade dispute with China and another interest rate increase by the Fed. Many investors are growing worried that corporate profits -- which drive stock market gains -- are poised to weaken. Technology stocks accounted for much of Monday's early bounce. Adobe rose 6.1 percent to $217.71. Payment processors Visa and Mastercard also headed higher. Visa added 4.3 percent to $126.99, while Mastercard gained 4.2 percent to $182.05. Big retailers were among the gainers. Amazon climbed 6.9 percent to $1,436.47. Kohl's gained 8.3 percent to $64.75. Nordstrom picked up 4.2 percent to $46.06. Homebuilders mostly rebounded after an early slide following a report indicating that annual U.S. home price growth slowed in October. PulteGroup climbed 2.2 percent to $25.22.